Description: Golden crown. White cap. Red circle with white text: CODE MIT GEWINNCHANCE UNTER JEDEM KRONKORKEN. 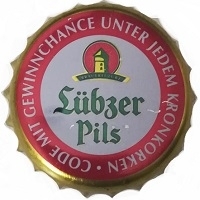 Green text: Lübzer Pils. Golden, green and red logo of a tower.